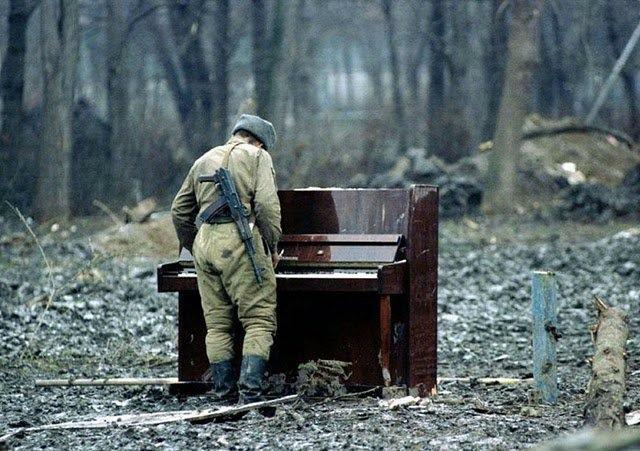 Sometimes playing music in tough places is an indescribable gift of God-given solace amidst a deeply wounded world. It is order in chaos. It is wordless poetry; flowing sounds infused with the meaning of the moment. When I improvise my thoughts and feelings in a melody, I release a message through creativity. This is why I am human. I create and recreate with the sounds God has given me. When an artist paints, his freedom lies in having the existent colours to create with. Without the colours, he cannot paint. But without the artist, there is no artistry - it becomes devoid of a message. Whatever you do with your life, your gifts - what is the meaning, the story, the gratitude, that you convey? Since I was fifteen, it had always been my desire to bring music to people in tough places who need such a solace - especially to children or young people who need to be ignited with a creative spark, because all their lives they have been told that they and their ideas do not matter. I believe that music speaks when there are no words to speak; it relieves the spirit when medicine cannot bring physical cure; it touches the part of a person that cannot be touched with human hands. I know many people would say that music is not as important as food or shelter or medicine. Of course, it does not appear to have immediate importance because it might not bring quick results. But what happens after a person is fed, clothed, and treated? What alleviates and restores a broken society - what empowers, inspires and energizes beyond mere physical sustenance? It is art, creativity, expression, beauty, innovation, and all these things that reside specially in human beings. Both here, and when I am out there traveling, teaching, sharing music, or doing missions and volunteer work, I am filled with the conviction that God has given us such inclinations because they remind us of who we are and what we were made for. It's powerful. I cannot for the life of me believe the nonsense that there is no meaning to our lives, that there is no moral compass, that there is no absolute truth, no divine love, no divine grace, no God who willingly walked among men and died for our sins that we might live and be restored to Him, to our purpose, and to each other. I know that He's real because Jesus has been real to me. This is my story, it is the very life I live. And what makes it amazing is that I can cross oceans and mountains and endless skies, only to meet other perfect strangers - both young and old alike - who witness to this same Jesus that they have encountered and who they say, with authentic enthusiasm, has transformed their lives and way of thinking and living. Scroll through my entries on this website, read the stories of the local heroes I've met, hear about the amazing 'coincidences' that I've experienced thus far in my journey. You'll be baffled, even awe-inspired, by these amazing souls. I acquired this poignant photo through an Afghan friend, Khudadad Hamraz.